Please let us know where you are willing to volunteer. 8:15-10:00 am - We need volunteers to help with childcare for children ages Birth-Kindergarten. 10:30-12:30 pm - We need volunteers to help with childcare for children ages Birth-Kindergarten. 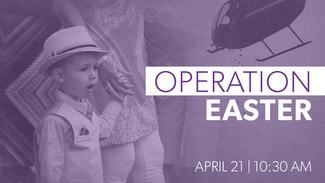 I'll probably help Justin and Stephanie with the boys during the Easter Egg drop, but I'll be available to work after 11:00 a.m. I would like to be w/ 2 year olds. Put me on standby for Traditional service also! On standby for Traditional service also. 8:15-9:15 am - We need people to assist in registering kids for childcare during the services, as well as Rooted in Worship. 10:30-11:30 am - We need people to assist in registering kids for childcare during the services, as well as Rooted in Worship. 9:00 - 11:15am - We are looking for outgoing individuals who will greet visitors as they arrive and direct them to the childcare registration tables and the correct zone for their kids. I’d like to greet near Laura Bolton. We need volunteers to help with stage transition between worship services, and set up and tear down sound system outside. We need volunteers to help with standing along the start barrier and then raising the barrier when the event begins.